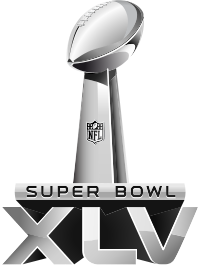 Congratulations to the Green Bay Packers on winning Super Bowl XLV. It was a gut-wrenching game for me. Green Bay took advantage of the three turnovers, one ranback for a touchdown. We enjoyed the game at a neighbors house. Plenty of drinks, pepperoni rolls, buffalo chicken bites, buffalo cheese dip, and fondue dessert. The kids played nicely in the basement and watched the half time show performed by the Black Eyed Peas. We enjoyed the show and the Doritos commercials. I guess I’ll follow hockey (Pittsburgh Penguins currently in second place one game behind the Philadelphia Flyers) till the end of the season and wait for pre-season in August.